The village of St Dogmaels is just two miles away from Allt Y Coed and is a must see when visiting the area, from its wonderful 12th century St Dogmaels Abbey ruins overlooking neat lawns and the great duck pond below. Along the way is a is Y Felin Water Mill & Tea Rooms that still make its own flour, with its tea room offering pastries baked from it s own produce, then there's estuary walks heading back towards Poppit Sands with fabulous views across the estuary towards Gwbert and the headland above. Across the coastal road from here you approach the picturesque secluded Mwnt. Last but not least there are several pubs and restaurants just a short journey from the campsite in St. Dogmaels. The village of St Dogmaels (or Llandudoch) has been awarded the Calor Gas Village of the Year award. There is also a general store and Post Office.Closer to home is Poppit Sands, (1 1/2 miles away) and is used for a wide range of activities, and has a cafe and shop. 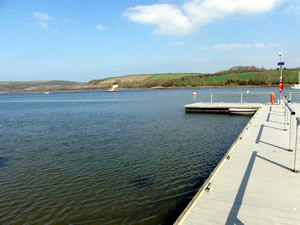 Above is the quay at the Moorings, St Dogmaels, on the River Teifi. Just 4 miles away is our local town Cardigan there you will find a range of activities to keep you and the children occupied including Swimming pool, cinema, shopping center, heritage center, art galleries especially the Pendre gallery/Shop/Cafe and of course the favorite of children and adults alike - Yum Yums Sweets shop with hundred of all our old favorite confectionary's and even a chocolate fountain! Also don't forget the book shops too and lots of local craft shops amongst much more. There is also a Tesco on the outskirts of Cardigan, but if you prefer to eat the produce that's available locally don't forget about many of the smaller shops around the town and in the market which cater and sell locally produced goods and foods. There are many restaurants to choose from, and there are pizza and kebab shops, curry house (which incidentally is aboard a boat!) Chinese and Tandoori also there are several cafes in Cardigan.